Nestled in between the majestic Blue Ridge Mountains, lies the scenic town of Lake Lure and the beautiful Sadie's Retreat, your home away from home! 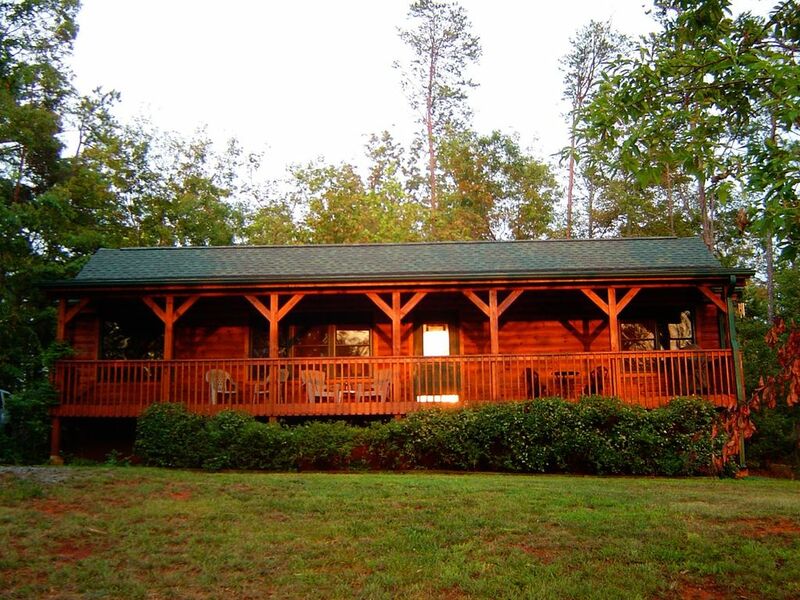 The fresh mountain air will greet you in the morning, as you enjoy your coffee on the rocking chair front porch. Inside the cabin, is a full equipped kitchen to begin your day with a hearty breakfast. Your daytime can be spent enjoying all the activities that Lake Lure has to offer - hiking, wine tasting, golfing, horse back riding, gem mining, boating, zip-lining, swimming, rejuvenating at a spa or shopping, all available within minutes of Sadie's Retreat. Looking for more - Chimney Rock, Biltmore Estates, Asheville, Hendersonville, Black Mountain, and much more, are all within a scenic 30 minute drive from Sadie's Retreat. Ready to return to Sadie's Retreat? Don't miss the sun setting over the Blue Ridge Mountains as you enjoy your beverage of choice on the porch at Sadie's Retreat. Looking for a private dinner? Sadie's Retreat is ready for you to cook whatever your heart desires! If you would rather continue your day of indulgence, Lake Lure boast many great restaurants and bars where you can relax and re-connect with each other. As your day comes to a close enjoy the glow from the fireplace on the oversize comfy couch. Finally sliding into the clean crisp sheets on your cozy beds, so you can dream about your activities for tomorrow! Lake Lure and Sadie's Retreat is just waiting for you! Leave the hustle and bustle of your daily life behind, and get back to what really matters in life - enjoying your time with your friends and family. I am a real estate agent in Charlotte, NC. I am happily married, with 2 beautiful kids. My husband and I visited Lake Lure on a vacation in 2006, and fell in love with the area. After that visit, we decided to begin looking for a cabin of our own. When we found Sadie's Retreat, we knew it was exactly what we were looking for! It has all the charm of a mountain getaway, but located close to all the activities that Lake Lure has to offer. Lake Lure is such a beautiful location. It has both the mountains, and the lake area. When we visited Lake Lure in 2006, we just couldn't get over all it had to offer. The mountains, lake, hiking, fishing, boating, shopping, great restaurants, vineyards, and much more! We decided that we had to share this location with others. We searched for just the right cabin for over a year. When we found 'Sadie's Retreat' we just knew we had found the perfect place. The view was so amazing, and the front porch allows you to relax from the hustle and bustle of every day life. The cabin is so nice. they provide everything that you need. Is near by the chimney rock very convenient. I will stay here in a future vacation. Very nice and quiet place to relax after a day of hiking! It could use an upgrade on the bed and maybe some extra seating in the living room. If it were more than just 2 of us, it would have been tight. All-in-all, very pleasant! Close to the grocery and many attractions such as Lake Lure beach, Chimney Rock State Park and downtown Chimney Rock. We loved our stay and will be back next fall. The cabin is very clean and cozy nice front porch we loved the rocking chairs and beautiful site of the mountains and Chimney Rock. Our dog felt right at home although we brought our own dogs bowls they even had some in the cabin for your pet. It was a close drive to all main attractions and Main Street with all the cute shops and Lake Lure which we walked our dog around. We took a boat ride around Lake Lure and it was great. There is a golf course only a couple minutes away and was amazing. It was so relaxing at the cabin and very quiet and peaceful we thoroughly enjoyed our stay. The only negative thing would be they need extra panel curtains in the living room for privacy and I would invest in a thick piece of foam for the bed our backs were sore in the morning. And a more comfortable sofa in the living room would be a benefit and one that is not so low to the floor. But even with that said we loved the cabin and everything that is provided for you is absolutely wonderful and we will be back without question. I would recommend this cabin to anyone. Thank you for making our stay a great experience we just had so much fun we can't wait to come back!!! We enjoyed our week long stay in Sadie’s Retreat! The cabin was clean, comfortable and had everything we needed. Kim was friendly and helpful. Nearby were many things to do and the area was a beautiful place to relax. I definitely recommend Sadie’s Retreat! We enjoyed our stay this past weekend. We had a weekend in with the family and enjoyed being able to find what we needed for preparing meals. Chimney Rock Park is located approximately 3 miles away from Sadie's Retreat. Take a deep breath of refreshing mountain air, become invigorated by their all ages hiking trails, and let your cares fade away at the base of the 404 foot waterfall of Hickory Nut Falls. Discover the beauty and charm of Lake Lure with Lake Lure Tours. Your skipper guides you past local attractions and landmarks, such as the locations used in filming the movie, Dirty Dancing. Plan your getaway to Biltmore House, located just 30 scenic miles from Sadie’s Retreat. Surrounded by inspiring gardens, America's most-visited winery, and the interpretive River Bend Farm. Also, take time to explore Lake Lure! Included in the area is antique shopping, golfing, hiking, horse back riding, beach access, and much more!